A throwing knife turns in flight, and it takes quite some practice to have it reaching the target point-first. That's no problem with the Gyro Pocket: In flight, its tip simply faces the target all the time, and it then sinks in with a good thud. This throwing knife is a new generation of the Flying Knife, and a sibling of the Gyro Dart. Inventor Paco Tovar crossed the concept of the spear-knife with a pocket knife. What you now get is a mini spear that folds to actually fit into your jeans pocket (a safety tape prevents it from opening) - a real pocket throwing knife! The Gyro Pocket is suitable for distances up to 7m. For a start, just stand in a distance of 5m from the target, remove the safety tape, and fold out the blade by rotating it out of the handle. Locking it in position means simply pressing down two metal pins into the metal head. Now grab the knife loosely, and with an equally loose wrist throw it. Done correctly, it will fly without turning. 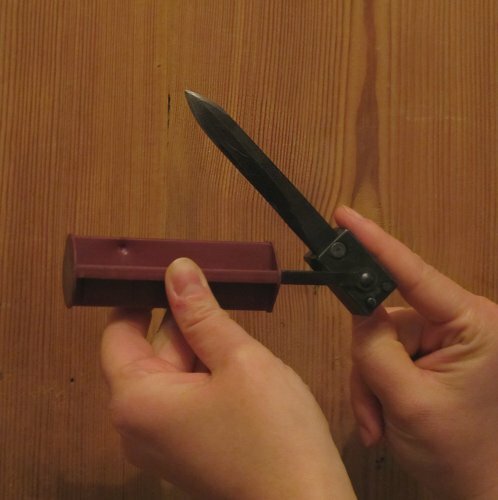 Doing it correctly is even easier than with the Flying Knife (because it is lighter). In fact, in our tests, knife throwers that like the no-spin or military style got the move down on the first try. Index finger, middle finger and thumb grab the metal head with their tips, like they would grab a walnut. The index finger rests behind the head, and will later propel the knife forward. Thumb and middle finger loosely grab the sides of the head. The elbow goes back, and thrusts the knife towards the target. The wrist is loose, it may flap around. The upper arm must not go down, but remain at least parallel to the ground. Feel the weight of the knife on the tip of your index finger, and throw with a loose wrist. Once you got the move down, it has a very natural flow. To get started, throw the knife into thin air until it flies tip-first. Then get a door-sized target where it simply sticks. Only afterwards you can start to get your aim down (think target-circles). For the more crazy throws, you should have a good aim, because even the Gyro Pocket won't hold up forever if you smash it handle-first onto the edge of the target. The Gyro Pocket is a throwing knife you can just take out into the garden and see what you can turn into a target. And from which special positions you're still able to stick it there ( video)! Total length 24cm, closed 14cm. Colours: Available in garden-green and wine-red.